All transactions are safe and secure with a reliable history in online purchasing behind each of our associates. Buy the Skywalking Dead t-shirt to own Walking Dead clothing and merchandise. Since the show premiered, people can't wait to get their hands on their very own AMC The Walking Dead shirt. 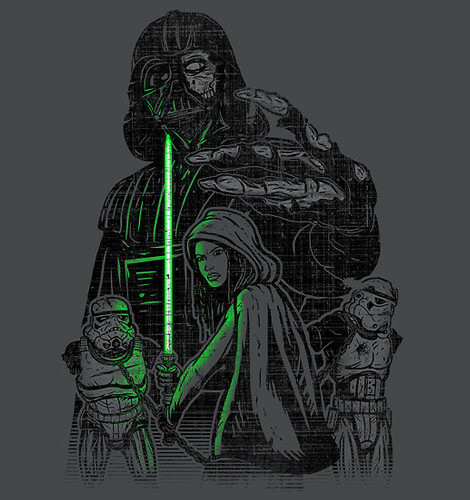 This unique Skywalking Dead design combines Michonne, one of the TV show's zombie slayers, with Star Wars. The comic style appearance lends itself to fans of all of the different series mediums, including The Walking Dead books, comics and AMC television show. If you haven't had the pleasure of reading the books or comics yet, then be sure to do some catching up before you watch the next season. In addition to the Skywalking Dead tee above, browse the Walking Dead Clothing Gallery for more apparel like men's and women's clothes, kids shirts or hoodies.